It's the great race - dress for the occasion! DUMMIES and nappies as well as the occasional drink will be on the agenda on Saturday, August 5, as a pram race starts from Walsden Waggon and Horses pub. The sponsored race, which will be started by the Todmorden Town Mayor, Coun Brian Hewson, and entertainer Roy "Elvis "Potts at 4pm is being held by Walsden Waggon Community Fund to raise money for St Peter's Church to restore the Walsden Infant School building so it can be used for future community events. Starting off at Walsden Waggon and Horses, teams will race their pram, each with an adult "baby" inside, along the pre-planned route stopping off at the pit stops which include the Border Rose, Cross Keys, Hollins, Bridge End, Woodpecker, Masons,Pockets and Walsden Cricket Club for a quick half pint at each before returning to Walsden Waggon and Horses. A trophy will be awarded to the first team back. Teams will be expected to be in full fancy dress of their choice with their "baby" in an outfit of nappy and bonnet along with a bottle, dummy and rattle. Fines will be charged for any dress item missing as well as for other rule breaking! A barbecue at the Walsden Waggon, run by Walsden Fisheries, awaits both participants and non-participants back at the pub. Food will be sold from 8pm to 10pm and there will be singing entertainment from Roy "Elvis" Potts as well as a disco and karaoke sponsored by Super Shine car wash.
A raffle and auction will also add to the evening's entertainment. On offer will include such delights as a free full interior valeting on a vehicle, a slave for a few hours, a wagon ride or a mini walkman. The event, which has already attracted large interest from local organisations has an entry fee of 10 and will allow six members maximum per team. Entry forms and a copy of the rules and regulations can be collected beforehand from the Walsden Waggon and Horses pub. Participants may enter on the day if they wish but all entrants must check into the Walsden Waggon and Horses by 3.30pm on the day. of the race. "It's a chance for people to get together and feel they belong to the community," said Brenda Marshall who is landlady of the Walsden Waggon and Horses which she runs with landlord Ian. "People already seem to be getting into the spirit of things," added Michelle Hartley of Walsden Waggon Community fund. "I've already had my pram stolen from outside for which a 20 reward will be given to the finder!" 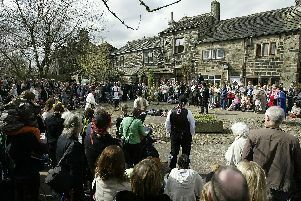 The fund which is staging the event was developed from the Walsden and Todmorden Community fund. The two charities will be joining back together on September 23 to stage the carnival which this year has the theme of "Going Back" in the years of music. Future fundraising events planned by the fund include a ceilidh band and spit-roast pig at the beginning of October and a Christmas party to add to the quiz night and bonus ball events which currently take place. Anybody with new ideas and suggestions for fundraising events or who wishes to make a donation to the fund can contact Michelle on 01706 817314 or 07759020293 or pop along to the weekly meetings which are held at the Walsden Waggon and Horses on Tuesdays at 8.30pm.